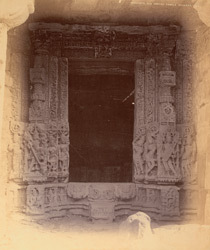 Photograph of a richly-carved doorway of an unidentified temple at Mandhata, Nimar District, taken by Henry Cousens around 1892-94. Mandhata is situated in the southern part of modern day Madhya Pradesh and is a celebrated site of pilgrimage for followers of Shiva. The religious importance of the town stems from the presence of the Omkareshvara temple, which houses one of the twelve most important lingas in India. The town is partially built on the banks, and partially on an island in the Narmada river. The hills around the town are home to a large number of much older, and now ruined, temples, fortifications and dwellings. The Siddhsesvara temple is the most notable of these, as it is built to an unusual, cross shaped plan and is the largest of the older temples.